Hosts Cook Islands will have their work cut out if they want to fulfill their quest of booking their place at the next stage of the OFC U-19 Championship later this year following a disappointing defeat to a resurgent Tongan side, while Samoa flexed their muscle against their neighbours American Samoa on the opening day of the Qualifier in Rarotonga. In soaring temperatures at the CIFA Academy, Samoa had to battle hard against their determined cousins in a hotly contested local derby. Despite creating a number of good goal scoring opportunities Valerio Raccuglia’s side were left frustrated as skipper Gabriel Taumua made a number of crucial tackles in the heart of the American Samoan defence to keep the scores level at the end of the first half. Although claiming the underdogs tag prior to the match the American Samoans were growing in confidence thanks to their defensive efforts and hoped to start causing a concerns for their opponents at the other end. The turning point came with the injection of Henry Smith into the match, which turned out to be an inspired substitution by the Samoa coach in the 62nd minute. Fifteen minutes later Smith was on hand to grab the lead against the tiring American Samoans and he only needed another four minutes to double his side’s advantage. 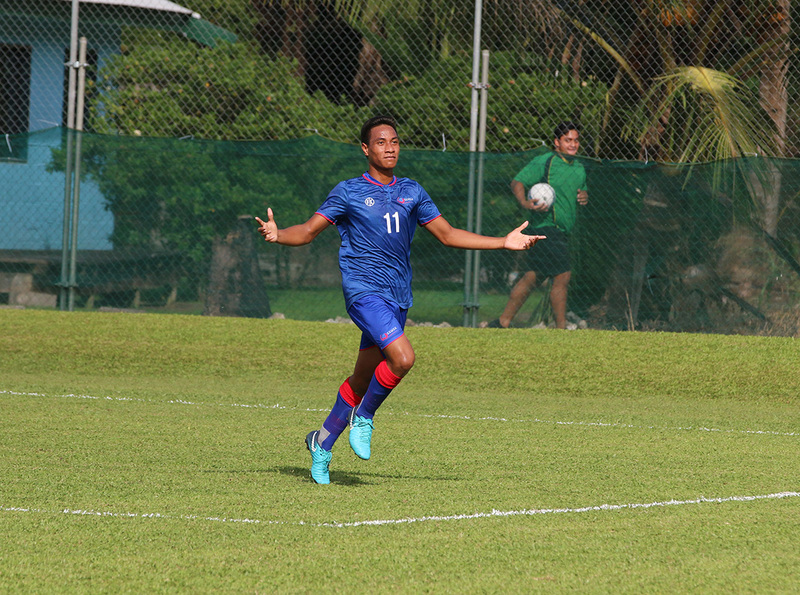 He completed his hat-trick deep into injury time to give Samoa a somewhat flattering 3-0 victory. Raccuglia has admitted his side didn’t played to their full potential. “I didn’t think we were good in the first half, we wasted too many chances and we didn’t create as much as I hoped as we did. And when we did we didn’t take it,” he said. Despite the defeat his counterpart Tunoa Lui was pleased with his side’s effort. “We knew Samoa is a very good team, and our team is underdogs but they held off Samoa in the first half, it’s just they were a little bit tired and watching the ball too much instead of reacting. “Playing against Samoa is a tough test for us, the boys are young, we have a very young team. But the way the game turned out today, I give credit to my boys, I want them to hold their heads up, they did very well,” Lui said. Backed by a vocal local crowd, Cook Islands started the second match of the opening day with plenty of promise, putting Tonga under a lot of pressure inside the opening 15 minutes. But after weathering the storm the visitors took the lead in the 17th minute as Tevita Kau finished off a swift counter attack. Things got worse for the hosts who found themselves three goals down 20 minutes later, after giving away two penalties, slotted home by Mohammad Rajani. Despite the three-goal gap the Cook Islanders fought bravely in the second half before their fate was sealed following a red card to Grafton Potoru. Following their well deserved win Tonga coach Soane Malia couldn’t hide his delight. “Our play in the first half was to protect our defence and when we got our opportunities on the counter we tried to score. “We knew that that Cook Islands always take the lead in these matches before, but we have a vision we have a goal, we work together and we’ve been looking better throughout our preparations and we believe in what we are doing,” Malia said. Cook Islands coach Alan Taylor rued his side’s first half mistakes but he also heaped praise on his players for their effort. “Disappointing after 30 minutes you give away two penalties and a silly goal and it’s hard to come back but the effort was good the commitment was great. We didn’t quite manage to get that first goal, if we got that first goal I think we could have got more than one, but we couldn’t quite break it down in the first half. “I can’t fault them for their effort, down to ten men and they were still putting their bodies on the line,” Taylor said.